Medical coding is booming. And with it, the demand for expert coders. The Bureau of Labor Statistics ranks the projected growth rate of this occupation above all others, at 22% through 2020. With the rapid expansion of the health care industry and the implementation of new coding protocols, systematic training has become vital to staying out front. These factors have led to a successful partnership between IU Southeast and Louisville, Ky.-based Norton Healthcare that helps coders take the next step in their careers, and seize opportunities in this growing market. Norton Healthcare is a recognized leader not only in healthcare but workforce development. Among the organization’s many initiatives, the Norton Scholars Program helps selected employees attend school, gain credit in a highly applicable skill and return to Norton Healthcare to be mentored through an experiential apprenticeship program until they are able to demonstrate a command of the key competencies of their position and “fly solo.” In certain cases, the program encourages and supports scholars who wish to continue through to obtaining a bachelor’s or post-graduate degree. Having identified and prioritized needs in the area of medical coding, in 2012 Norton Healthcare sought a partner for holistic collaboration in keeping with its standards and values. They decided to partner with IU Southeast. Sandra Johnson, senior lecturer of biology who leads the IU Southeast medical coding certificate program, was that partner with the foresight and flexibility to adapt to the need. As the co-author of Understanding Medical Coding, a leading instruction manual for the CPC examination, and with over 35 years of experience in the field, she is a recognized expert on medical coding and transcription. Johnson’s students have gone on to careers at Floyd Memorial and Clark Memorial hospitals, Kentucky One Health, University of Louisville physicians groups, Humana, Baptist Health, First Urology – the list goes on. In short, she was the perfect person to help Norton Healthcare students navigate ICD-10, the international coding standard of the World Health Organization recently implemented in the U.S.
As technology permits more differentiated assessment, and billing demands more nuanced description of interventions, the number of codes in play has mushroomed from roughly 14,000 in ICD-9 to nearly 70,000 in ICD-10, breaking down each office visit or medical procedure into ever more granular informational units — like the individual frames that make up a motion picture. Understanding those units – the codes — and the way they interact to make up a fully descriptive and billable story, is the basic job of the coder. 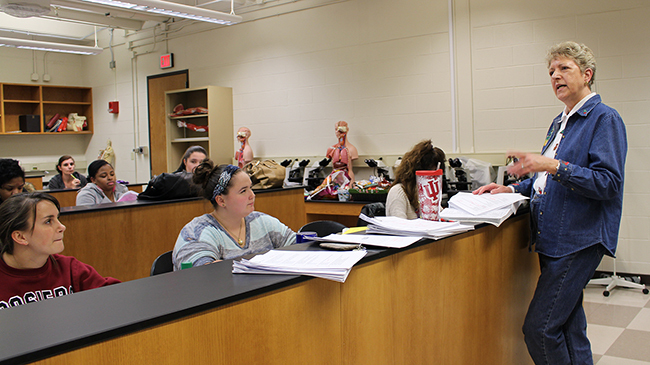 Sandra Johnson, senior lecturer of biology, leads the rigorous medical coding program at IU Southeast. The challenge is apparent. So is the importance. The medical coding certificate program consists of 18 credit hours with optional courses in pharmacology, physiology/anatomy and informatics, depending on the student’s individual need or interest. While the philosophical synergy between the two organizations was present from the get-go, making the program work took some tweaks. To accommodate Norton Healthcare students who worked all day at facilities across the region, courses were shifted to evenings. Course registration numbers and wait-list and classroom capacities were monitored and adjusted to make sure students were able to get into the courses they needed at the right time and in the right sequence. And the students had widely varying academic backgrounds, requiring advisors Jessica Sarver and Valeria Aramburu to go the extra mile to get them registered in time. Few students better exemplify the success of the partnership than Tamika Forbes. A native of Louisville, Ky. Forbes had worked with Norton Healthcare in an entry level role as a vendor support analyst, responsible for billing accounts and financial assistance applications. She wanted to move up. 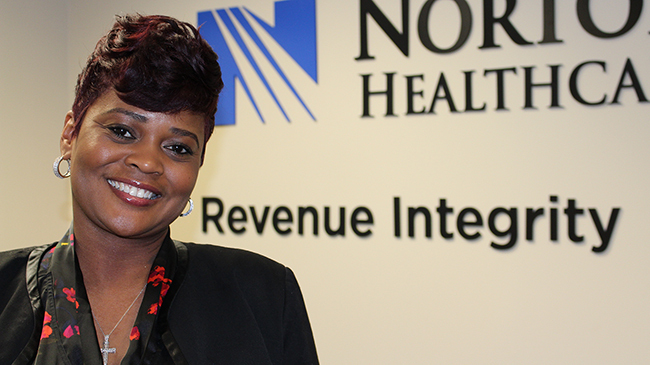 Tamika Forbes moved through the medical coding program, and moved forward in her career. Forbes was accepted into the Norton Scholars program, and attended courses in medical terminology, body structure and function, pathology, medical coding, health information management and reimbursement at IU Southeast. She passed the CPC exam, absolved the apprenticeship program, and today she is a revenue audit-coder, a significant advancement over her initial position. The relationship is a win-win. Norton Healthcare gains team-members who are trained to address coding workflow but who also are empowered to ultimately become leaders. IU Southeast gains another important regional partner and a source of students who enrich the classroom with their background in the working environment. Now in its third year, the collaboration can be seen as part of larger community workforce development initiatives shaping the region. Another example is the Kentucky Health Careers Collaborative, a forum for employers, educators, government and others to meet and help to better align academic institutions and programs with workforce needs, in which Norton Healthcare is a partner. IU Southeast is also a participant in this dynamic ongoing conversation. “We’re working together to create career pathways and give individuals the opportunity to be successful,” Ralston said. For her part, Forbes is not finished learning. She aims for a role in management. “We will always need healthcare, and there will always be room to grow,” she said. Homepage photo: Medical coding provides a detailed record of patient care.